RIM To Officially Launch BlackBerry Desktop Manager for Mac on October 2nd!! It's the last day of September and RIM promised to have BlackBerry Desktop Manager for Mac officially available by then. Unfortunately, you can't download it today but they did fire off a press release letting us know it will be here this Friday, October 2nd, at 1pm EDT. A couple more days won't kill us, so it's allllll goood. THANKS RIM!!!!! WATERLOO, ONTARIO--(Marketwire - Sept. 30, 2009) - Research In Motion (RIM) (NASDAQ:RIMM)(TSX:RIM) has exciting news for Mac(R) users that want an easy and reliable solution that syncs their contacts, calendar appointments, tasks and notes with their BlackBerry(R) smartphones. 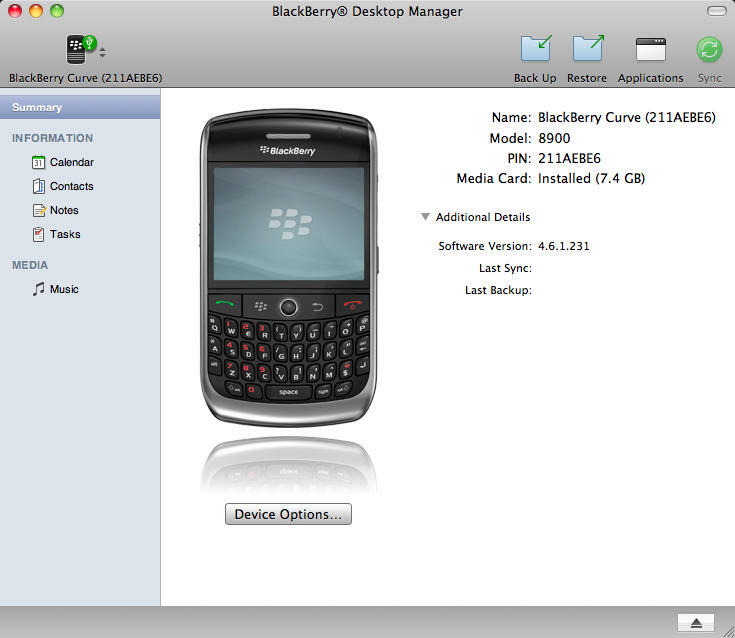 A new version of the BlackBerry(R) Desktop Manager software has been developed specifically for Mac users. The new desktop software is scheduled to be available for free download from www.blackberry.com/mac on Friday, October 2 at 1:00 p.m. Eastern Daylight Time. The new BlackBerry Desktop Manager software allows Mac users to smoothly and seamlessly sync data from Mac applications like iCal(R), Address Book, Microsoft(R) Entourage(R) and others, as well as add and remove applications, schedule automatic backups, encrypt backup files and install software updates for their BlackBerry smartphone. BlackBerry Desktop Manager Software also integrates BlackBerry Media Sync, enabling Mac users to sync their iTunes(R) music collections with their BlackBerry smartphone(i). From within the BlackBerry Desktop Manager software, users simply select the desired iTunes playlists and the music, including song information and album art, is quickly transferred onto their BlackBerry smartphone.